Hun Sen (Khmer: ហ៊ុន សែន; born 5 August 1952[a]) is a Cambodian politician and the Prime Minister of Cambodia, President of the Cambodian People's Party (CPP) and Member of Parliament (MP) for Kandal. He has served as Prime Minister since 1985, making him the world's second longest-serving prime minister, the longest-serving head of government of Cambodia and one of the longest-serving leaders in the world. From 1979 to 1986 and again from 1987 to 1990, Hun Sen also served as Cambodia's foreign minister. His full honorary title is Samdech Akka Moha Sena Padei Techo Hun Sen (Khmer: សម្តេចអគ្គមហាសេនាបតី តេជោ ហ៊ុន សែន; meaning "Lord Prime Minister, Supreme Military Commander Hun Sen"). Born Hun Bunal, he changed his name to Hun Sen in 1972 two years after joining the Khmer Rouge. Hun Sen rose to the premiership in January 1985 when the one-party National Assembly appointed him to succeed Chan Sy, who had died in office in December 1984. He held the position until the 1993 UN-backed elections, which resulted in a hung parliament. After contentious negotiations with the FUNCINPEC, Hun Sen was accepted as Second Prime Minister, serving alongside Norodom Ranariddh until a 1997 coup toppled the latter. Ung Huot was then selected to succeed Ranariddh. In the 1998 election, he led the CPP to victory but had to form a coalition government with FUNCINPEC. Hun Sen has since led the CPP to consecutive victories and is currently serving in his fifth prime ministerial term. In June 2015, following the death of Chea Sim, Hun Sen was elected president of the CPP. In 2018, he was elected to a sixth term in a largely unopposed poll, with the CPP winning every seat in the National Assembly. Hun Sen was 32 years old when he became prime minister, making him at that time the world's youngest head of government. He has been described as a "wily operator who destroys his political opponents" by The Sydney Morning Herald and as a dictator who has assumed authoritarian power in Cambodia using violence, intimidation and corruption to maintain his power base. [according to whom?] Under his government, thousands of opposition activists, politicians, environmentalists and human rights workers have been murdered, where a majority of the cases were never investigated due to the political ties with the incumbent administration. Hun Sen has accumulated highly centralized power within Cambodia, including a personal guard said to have capabilities rivalling those of the country's regular army, making coup attempts virtually impossible. Hun Sen became one of the leaders of the rebel army and government that the Vietnamese government sponsored when they prepared to invade Cambodia. When the Khmer Rouge regime was defeated, Hun Sen was appointed as Deputy Prime Minister and Foreign Minister of the Vietnamese-installed People's Republic of Kampuchea/State of Cambodia (PRK/SOC) in 1979. As the de facto leader of Cambodia, in 1985, he was elected as Chairman of the Council of Ministers and Prime Minister, following the death of Chan Sy. As Foreign Minister and then Prime Minister, Hun Sen played a pivotal role in the 1991 Paris Peace Talks, which brokered peace in Cambodia. During this period Prince Norodom Sihanouk referred to him as a "one-eyed lackey of the Vietnamese". In 1987, Amnesty International accused Hun Sen's government of torture of thousands of political prisoners using "electric shocks, hot irons and near-suffocation with plastic bags." After the UN monitored elections, he refused to step down from the post and negotiated a transitional government agreement that allowed him to remain as co-prime minister but he retained the chairmanship of the CPP. From 1993 until 1998 he was Co-Prime Minister with Prince Norodom Ranariddh. In 1997, the coalition was shaken by tensions between Ranariddh and Hun Sen. FUNCINPEC entered into discussions with the remaining Khmer Rouge rebels (with whom it had been allied against Hun Sen's Vietnamese-backed government during the 1980s), with the aim of absorbing them into its ranks. Such a development would have altered the balance of military power between royalists and the CPP. In response, Hun Sen launched the 1997 Cambodian Coup, replacing Ranariddh with Ung Hout as the First Prime Minister and maintaining his position as the Second Prime Minister, a situation which lasted until the CPP's victory in the 1998 election, after which he became the country's sole Prime Minister. During that year the media portrayed him as the Strong Man of Cambodia. He later said that this was premature, and that the July 1997 coup was merely the government taking action against the paramilitary anarchy that was sponsored and brought to Phnom Penh by Norodom Ranariddh. In an open letter, Amnesty International condemned the summary execution of FUNCINPEC ministers and the "systematic campaign of arrests and harassment" of political opponents. The controversial and widely disputed elections of July 2003 resulted in a larger majority in the National Assembly for the CPP, with FUNCINPEC losing seats to the CPP and the Sam Rainsy Party. However, the CPP's majority was short of the two thirds constitutionally required for the CPP to form a government alone. This deadlock was overcome when a new CPP-FUNCINPEC coalition was formed in mid-2004, with Norodom Ranariddh chosen to be head of the National Assembly and Hun Sen again becoming sole Prime Minister. On 6 May 2013, Hun Sen declared his intention to rule Cambodia until the age of 74. In August 2013, Hun Sen announced the he would continue to pursue his aim of forming a new government, even if the main opposition tried to block the process. The news came after both sides claimed victory in the July 2013 general elections. Also in August, in New York, a major, but largely unnoticed, demonstration held in front of the United Nations (UN) on 19 August by Cambodians and Buddhist monks was a crucial prelude to planned mass demonstrations in Phnom Penh later in September 2013 by opposition groups protesting the July 2013 elections and Hun Sen's response. Cambodians in the United States, Canada and elsewhere, with hundreds of Buddhist Monks, peacefully protested in front of the United Nations in New York City in opposition to Hun Sen's deployment of military and security forces in Phnom Phenh and his unwillingness to share political power with opposition groups and seriously address earlier voting fraud and election irregularities from the July 2013 election. After the 2013 election results, disputed by Hun Sen's opposition, one person was killed and others injured during protests in Cambodia's capital, where a reported 20,000 protesters gathered, some clashing with riot police. Following two weeks of opposition protests, Hun Sen declared that he had had been constitutionally elected and would not step down nor hold a new election. On 7 September 2013, tens of thousands of Cambodians, along with Buddhist monks and opposition groups, including Sam Rainsy's Cambodian National Rescue Party held mass demonstrations in Phnom Penh to protest the 28 July elections results which they claimed were flawed and marred by voting irregularities and potential fraud. The groups asked the United Nations to investigate and claimed that the elections results were not free and fair. On 3 January 2014, military police open fired at protesters, killing 4 people and injuring more than 20. The United Nations and US State Department have condemned the violence. US Congressman Ed Royce responded to the report of violence in Cambodia by calling for Hun Sen to step down, saying that the Cambodian people deserve a better leader. On 10 June 2014, Hun Sen made a public appearance and claimed he has no health problems. He warned that if he were to die prematurely, the country would spin out of control and the opposition could expect trouble from the armed forces, saying he is the only person who can control the army. In November 2016, Hun Sen publicly endorsed US Republican presidential candidate Donald Trump who went on to be elected president. Following Hun Sen's orders, on 31 January 2017, the National Assembly voted unanimously to abolish the Minority Leader and Majority Leader positions to lessen the opposition party's influence. On 2 February 2017, Hun Sen barred the opposition from questioning some of his government ministers. Furthermore, Hun Sen vowed a constitutional amendment which could potentially see the opposition Cambodia National Rescue Party dissolved. This move led to the surprise resignation of opposition leader Sam Rainsy. The controversial law was passed on 20 February 2017, effectively granting the ruling party the right to dissolve political parties. On 30 June 2018, weeks before the parliamentary elections, Hun Sen appointed his second eldest son, Hun Manet, into higher military positions in a bid to prepare his son for the premiership when he retires in politics or dies, effectively solidifying the Hun political dynasty in Cambodia. Hun Sen has also been conducting image campaigns for his son, which he says was born from a 'supernatural' being and therefore, divine or godly. Political experts have said that Hun Sen's campaigns may lead Cambodia to a dynasty similar to Kim Jong-un's family of North Korea. Protesters against Hun Sen's dictatorship in Cambodia. Some political opponents of Hun Sen have in the past tried to accuse him of being a Vietnamese puppet. This is due to his position in the government created by Vietnam while Cambodia was under Vietnamese military occupation and the fact that he was a prominent figure in the People's Revolutionary Party of Kampuchea (now known as the Cambodian People's Party), which governed Cambodia as a one-party state under Vietnamese military occupation from 1979 until elections in 1993. Hun Sen and his supporters reject such charges, saying that he only represented the Cambodian people. Hun Sen's government has been responsible for leasing 45% of the total landmass in Cambodia—primarily to foreign investors—in the years 2007-08, threatening more than 150,000 Cambodians with eviction. Parts of the concessions are protected wildlife areas or national parks, and the land sales have been perceived by observers as government corruption. Already thousands of citizens have fallen victims of forced evictions. Hun Sen was implicated in corruption related to Cambodia's oil wealth and mineral resources in the Global Witness 2009 report on Cambodia. He and his close associates were accused of carrying out secret negotiations with interested private parties, taking money from those[further explanation needed] who would be granted rights to exploit the country's resources in return. The credibility of this accusation has been challenged by government officials and especially Prime Minister Hun Sen, himself. Hun Sen’s Cambodian People’s Party (CPP) has placed bans on public gatherings, driven opposition supporters from the site of former protest meetings 'Freedom Park', and deployed riot police to beat protesters and detain union leaders. Hun Sen and his political party, CPP, have held near total dominance over the mainstream media for the majority of their rule. Bayon Television is owned and operated by Hun Mana Hun Sen's eldest daughter. Apsara TV [fr] is joint-owned by Say Sam Al, CPP Minister of Environment and son of Say Chhum, CPP secretary and the son of CPP Deputy Prime Minister Sok An. CTN, CNC and MyTV are all owned by Khmer-Chinese tycoon, Neak Okhna Kith Meng, one of the State's "Okhna". Okhna is a title granted by the Prime Minister or the Royal Family to high-profile businessmen, and signifies a very close friendship. Okhna are regularly summoned by the Prime Minister to provide funding for various projects. CPP officials claim that there is no connection between the TV stations and the state, despite the obvious prevalence of nepotism. However, CPP lawmaker and official spokesman Cheam Yeap once stated "We pay for that television [coverage] by buying broadcasting hours to show our achievements," indicating that those TV stations are pro-CPP because they have been paid for by the state for what is effectively advertising. A demand for television and radio licences was one of 10 opposition requests adopted by the Cambodia National Rescue Party (CNRP) at its "People’s Congress" in October 2013. Radio stations were banned from broadcasting Voice of America and Radio Free Asia in August 2017. The country’s most prominent independent newspaper Cambodia Daily was closed on September 4th, 2017, a day after the main opposition leader Kem Sokha was arrested for treason, one of many activists, politicians and critics at present behind bars. Hun Sen is married to Bun Rany. They have 6 children: Kamsot (deceased), Manet, Mana, Manith, Mani and Sok Chan. Hun Manet is a 1999 West Point Academy graduate and obtained his PhD in Economics at the University of Bristol. In 2010, Manet was promoted Major General in the Royal Cambodian Armed Forces (RCAF) and became the Deputy Commander of the Prime Minister's Body Guard headquarters. All three of Hun Sen's sons play big roles in his regime. His older brother, Hun Neng, is a former governor of Kampong Cham and currently a member of parliament. Although Hun Sen's official birthday is 4 April 1951, his true birth date is 5 August 1952. Hun Sen is fluent in Vietnamese, in addition to his native Khmer. His fluency in Vietnamese has made him a target of criticism among anti-Vietnamese detractors. Hun Sen also speaks some English after beginning to learn the language in the 1990s, but usually converses in Khmer through interpreters when giving formal interviews to the English-speaking press. Hun Sen is blind in one eye because of an injury dating to his days as a soldier. ^ ppp_webadmin (31 December 2009). 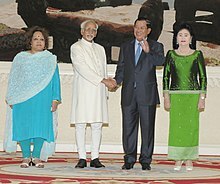 "ROYAL LETTER: Sihanouk praises five star leaders". Phnom Penh Post. Retrieved 5 December 2018. ^ Party, Cambodian People's (27 December 2009). "Welcome to Cambodian People's Party- CPP News and Information Wolrd Wide: His Majesty Promotes Cambodian Leaders to Five-Star General". Retrieved 5 December 2018. ^ a b "Samdech Hun Sen". cnv.org.kh. Retrieved 1 March 2014. Born on August 5, 1952 (officially on April 4th, 1951) in Peam Koh Sna Commune, Stoeung Trang District of Kampong Cham Province, upon completion of his local primary schooling, in 1965 Hun Sen came to Phnom Penh to continue his secondary education in the Lycée Indra Devi. ^ "Welcome, Lord Prime Minister: Cambodian media told to use leader's full royal title". The Guardian. 12 May 2016. Retrieved 26 September 2016. ^ "CPP Wins, but Suffers Loss in Parliamentary Majority". The Cambodia Daily. 29 July 2013. Retrieved 3 December 2016. ^ "Hun Sen Elected President of Ruling Cambodian People's Party". Radio Free Asia. 22 June 2015. Retrieved 3 December 2016. ^ "Cambodia: Hun Sen re-elected in landslide victory after brutal crackdown". The Guardian. 29 July 2018. Retrieved 16 September 2018. ^ "Australia asks Cambodia to take asylum seekers amid violent crackdown". The Sydney Morning Herald. 24 February 2014. Retrieved 25 February 2014. ^ "Tenth out of Ten". The Economist (Banyan, Asia). 17 November 2012. Retrieved 29 September 2013. ^ Marshall, Andrew R.C. ; Thu, Prak Chan (18 September 2013). "Analysis: Punished at the polls, Cambodia's long-serving PM is smiling again". Reuters. Retrieved 29 September 2013. ^ Thomas Fuller (5 January 2014). "Cambodia Steps Up Crackdown on Dissent With Ban on Assembly". The New York Times. Retrieved 8 January 2014. ^ David Robert Jr. (7 December 1989). "Cambodia's Hun Sen Is Himself Khmer Rouge" (Readers Opinion). The New York Times. Retrieved 13 February 2014. ^ Steven Erlanger (27 August 1989). "Cambodia's Hun Sen; In Phnom Penh, Vietnam's 'Puppet' Is Finding His Voice" (Week in Review). The New York Times. Retrieved 7 July 2016. ^ a b Shenon, Philip (15 November 1991). "Joyous Sihanouk Returns to Cambodia From Exile". The New York Times. Retrieved 19 October 2013. ^ unknown (4 June 1987). "Cambodia is Said to Torture Prisoners". The Boston Globe. HighBeam Research. Archived from the original on 11 June 2014. Retrieved 13 February 2014. ^ Amnesty International (June 1987). "Kampuchea: Political Imprisonment and Torture". London. ^ Kamm, Henry (1998). Cambodia. New York: Arcade Publishing, Inc. pp. 237–240. ISBN 1-55970-433-0. ^ "Hun Sen's profile". The Cambodia Daily News. 28 November 2011. Retrieved 19 October 2013. ^ Secretary General Pierre Sane (11 July 1997). "Open letter to Second Prime Minister Hun Sen". Amnesty International. Archived from the original on 16 March 2014. Retrieved 13 February 2014. ^ Prak Chan Thul (2 August 2013). "Defiant Hun Sen says to form government despite Cambodia poll row". Reuters. ^ "Cambodia, Buddhist Monks' Rally at United Nations: Prelude to Upcoming Phnom Penh Demonstrations - Business Wire". businesswire.com. 6 September 2013. ^ Kuch Naren. "Hun Sen Says He Will Not Resign, or Call Election". The Cambodia Daily. ^ Thul, Prak Chan (8 September 2013). Martin Petty; Michael Perry (eds.). "Cambodia opposition rallies in push for poll probe". Reuters. Retrieved 14 February 2014. ^ unknown (6 September 2013). "Cambodia, Buddhist Monks' Rally at United Nations: Prelude to Upcoming Phnom Penh Demonstrations". Businesswire. Retrieved 14 February 2014. ^ "Workers, Police Clash, Leaving 3 Dead in Cambodia". VOA. 3 January 2014. Retrieved 17 February 2014. ^ "United Nations News Centre". UN News Service Section. 3 January 2014. ^ Sok Khemara (7 January 2014). "US House Foreign Affairs Chair Calls for Hun Sen to Step Down". Voice of America. Retrieved 17 February 2014. ^ "Cambodian PM Says Opposition Will Rue His Death". Associated Press. 10 June 2014. Retrieved 15 June 2014. ^ "Hun Sen Endorses Trump—For World Peace". The Cambodia Daily. 4 November 2016. Retrieved 8 November 2016. ^ Kuch, Naren (31 January 2017). "Culture of Dialogue Faces Official Demise". The Cambodia Daily. Retrieved 7 February 2017. ^ Prak Chan Thul (11 February 2017). "Cambodia opposition leader Rainsy resigns from party". Reuters. Retrieved 12 February 2017. ^ "Cambodia changes political rules in 'triumph of dictatorship', critics say". Australian Broadcasting Corporation. 20 February 2017. Retrieved 20 February 2017. ^ hermesauto (30 June 2018). "Cambodian strongman's son assumes powerful military roles". The Straits Times. Retrieved 5 December 2018. ^ Note: See Botum Sakor National Park for example. ^ Adrian Levy; Cathy Scott-Clark (26 April 2008). "Country for sale". The Guardian. Retrieved 13 February 2014. ^ "Labour activism in Cambodia". The Economist. Retrieved 5 June 2014. ^ Alex Willemyns. "Opposition's Demand for TV Access Crucial, Futile - The Cambodia Daily". The Cambodia Daily. ^ Brinkley, Joel (2011). Cambodia's Curse. New York: PublicAffairs. ISBN 9781586487874. ^ Kuch Naren. "CNRP Launches Online TV to Break CPP's Media Stranglehold". The Cambodia Daily. ^ Ponniah, Kevin (7 November 2013). "CNRP has view to TV licence". The Phnom Penh Post. Retrieved 14 November 2013. ^ Closing Time, The Economist, September 9th-15th, 2017, pp. 45-46. ^ "Not quite the usual walkover". The Economist. ^ Kuch Nara (26 May 2014). "Hun Sen Warns Of Doomsday Scenario if CPP Defeated". The Cambodia Daily. Retrieved 2 January 2015. ^ Ngọc Hà (27 December 2013). "Thủ tướng Hun Sen nói tiếng Việt để chia sẻ hồi ức". Vietnam Television. Retrieved 2 January 2015. ^ Though he was born on 5 August 1952, his birthdate in official documents is 4 April 1951.